Most people—even those well-versed in modern dance history—have never heard the name Michio Ito. There is, after all, a reason he is called the "forgotten pioneer of American modern dance," as Mary Jean Cowell wrote for the Dance Heritage Coalition. And it's important to point out the qualifier "American," because Ito was born and raised in Japan. His life as a choreographer, however, developed in New York alongside the great modern dance pioneers we so often acclaim: Doris Humphrey, Martha Graham, Mary Wigman. But, likely in large part because of his Japanese heritage and America's discomfort with people of Asian ancestry during the early decades of the 20th century, the memory of Ito's name and works have faded, at least here in the U.S. Without Repertory Dance Theatre, there is a chance that no one in this country would remember Ito today. 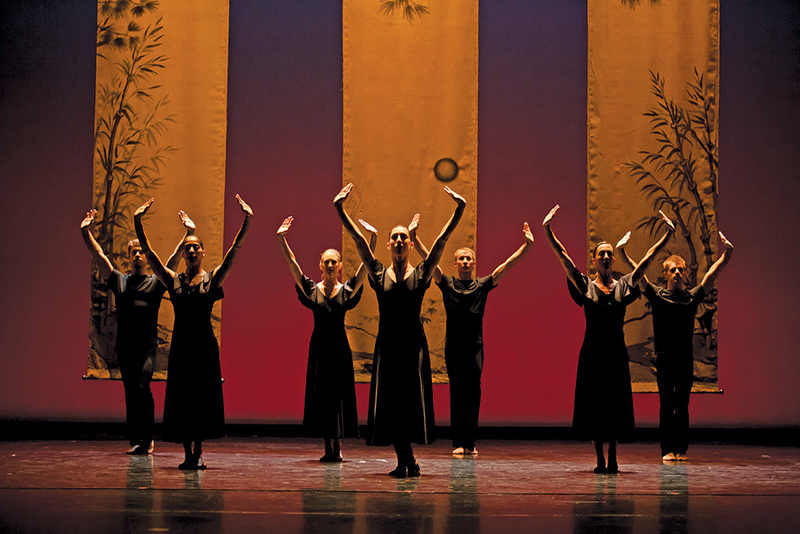 Decades ago, RDT became the repository of Ito's body of work in the U.S. As a repertory company—the first in the nation when they started in 1966—RDT has a mission to preserve and perform important works from the entire history of modern dance. As part of that pursuit, every few years they find a place for Ito. That time has now come again. For Spirit, the company's opening performance of the 2018-19 season, RDT gathers the work of four choreographers whose collective careers span nearly 100 years. In addition to Ito, who choreographed mainly from the 1920s through the '40s, and the masterpiece Rainbow Round My Shoulder (1959) by Donald McKayle, Spirit presents world-premiere commissions by two contemporary choreographers: Tiffany Rea-Fisher with Her Joy, and local choreographer Natosha Washington with Say Their Names. "We are in an interesting time in our culture where all kinds of things have happened," RDT artistic director Linda C. Smith says, "and people are talking about diversity and the lack of diversity, and immigration and racial discrimination. Modern dance has always had a wonderful convergence of music and ideas from all over the world. It mirrors the rich tapestry of the American experience. [Our dance company] wanted to recognize the benefit of that." With all that in mind, Smith says that Spirit, with three African-American choreographers and a Japanese choreographer filling the bill, is just the beginning of a journey for RDT. Diversity is the theme of the company's season; their next performance, in November, will feature guest performers from some of Salt Lake City's South American, Asian and Pacific Islander dance communities. In preparation for performing Ito's works, RDT rehearsed with master teachers Kyoko Imura and Kumiko Komine from the Association of Michio Ito Disciples in Tokyo. "They are delightful to perform with," Smith says, "and they work wonderfully on a program even with contemporary works. You can see the movement language very clearly, like in classical ballet; you see the steps and poses and how that informs the choreography. They look fresh alongside the contemporary choreography." Ito's life was as fascinating as his choreography. Born into a wealthy and well-educated Japanese family, Ito sought an unconventional life when he left for Paris as a teenager to study music and opera. There, he became seduced by the emerging world of modern dance. Changing his artistic course, Ito, at the onset of World War I, was lured to London and then ultimately to New York City. In the U.S., he began splitting his time between New York and Hollywood, creating pieces for Broadway and for film. At the time, Americans were wild for anything exotic and "Oriental." Ito never did use traditional Japanese movements, and he would often say, "My dancing is not Japanese, it is only myself." But his work did create an aesthetic fusion of East and West. Ito was also the first modern choreographer to solidify his style into a body of technique that could be taught. The technique is composed of two very precise sequences of 10 gestures each. The A-series is considered masculine, while the B-series is feminine. Each is performed with a precise breathing pattern. From these gestures, Ito's work unfolds as the maneuvers become more intricate, with movements layered on top of one another. Ito's residency in the U.S. came to an untimely end, at a moment in our history much like today, when the politics of fear seemed to overtake the voices of reason and logic. Within hours after the bombing of Pearl Harbor, Ito was arrested for espionage. Shortly before being sent to a prisoner-of-war camp, he was deported to Japan as part of a prisoner swap. Ito never returned to live in the U.S.—but, thanks to RDT, his legacy remains.